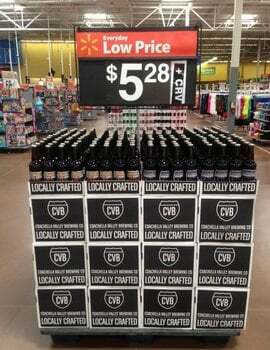 The Coachella Valley Brewing Co. (CVB) and Young’s Market Co. announced that their partnership has brought craft beer to Walmart and other large retailers. With its unique and iconic branding, the Coachella Valley Brewing Co. beers have flown off the shelves, according to the brewery. The three brands distributed by Young’s Market Co. in bottles — Desert Swarm, Kolschella and Monumentous Double IPA — have already had a successful launch within big retail chains such as Whole Foods, Total Wine & More, Bristol Farms, Sprouts Markets, Beverages & More, Albertsons, Walmart and Walmart Neighborhood Markets. Additionally, Young’s Market Co. also distributed CVB Monumentous and Kolschella in draft in Orange and San Diego Counties. Demand for CVB beers has already moved from the Southern California desert resort hamlet all the way up to Northern California. As the Coachella Valley is flooded in April with concert-goers from all regions, these retailers have exposed a larger audience to the CVB brand with much success so far. With its grand opening on August 30, 2013, Coachella Valley Brewing Co. has gone from a small lofty notion into a full-fledged reality. Focusing on the uniqueness of the Southern California desert, Coachella Valley Brewing Co. strives to connect both ends of the Coachella Valley through quality locally grown ingredients and expertly crafted beers. Locally owned and operated in Thousand Palms, Calif., Coachella Valley Brewing Co. is committed to crafting beer that showcases the agriculture and attitudes of the desert. Young’s Market Co. was founded in 1888 and is one of the oldest continuously operating companies in the United States. In the 68 years since Young’s Market Co. decided to engage exclusively in the wholesale distribution of wine, spirits and beer, it has grown from a relatively small local distributor servicing Southern California to one of the largest alcoholic beverage distributors in the United States. Young’s Market Co. currently has operations in California, Arizona, Hawaii, Oregon, Washington, Alaska, Idaho, Utah, Montana and Wyoming. New Belgium Brewing to open Hawaii with Young’s Market Co.